This is an awesome recipe from Shanti Krishnakumar's cook book. 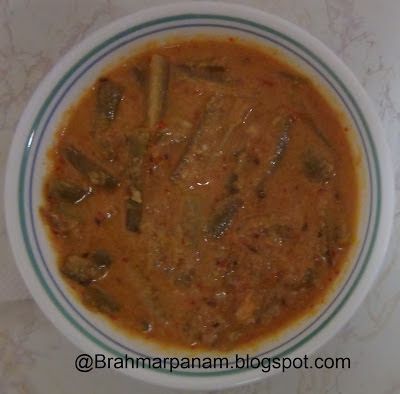 Not many like Kovakkai in my house but everybody loved this dish and Kovakkai is a very healthy vegetable too. In a pressure pan, heat oil and add the cumin seeds, cinnamon, cardamom and cloves. When the cumin seeds start spluttering, add the tomatoes and saute well. Add the Kovakkai / Parwal, turmeric powder, coriander powder and salt and mix well. Add 1/4 cup water and pressure cook for 1 whistle. Meanwhile, grind the cashews, coconut, and red chillies to a fine paste and keep aside. When the pressure is released from the pan, take out the lid and add the ground paste and garam masala. Add milk and cook in low heat till the gravy thickens and becomes creamy. Serve hot with any Indian flat bread of your choice. It goes well with rice too! Glad it came out well. Thanks for linking me. You have a wonderful space.